I'm adding a unique blog to the Continuing Education Board here at Happy Medic Head Quarters. The Engine 17 Project chimed in on a recent post and I'm intrigued. The author is finding the original Engine from his childhood neighborhood and restoring it to it's prior glory. The updates are coming slowly, but that is understandable with such a project. Click over and catch up, won't take more than 20 minutes and counts as a full hour of CE's for your refresher. Plus she's an ALF 900 series. Happy is in the market for this Engine's cousin, the ALF 100' tractor tiller. Hey, I miss the cartoon character! Since you've never bothered to give us a picture of what yourself, that was what I thought you really looked like! I like the new one, too. Less Happy, more fire-ey. I've got my own fire truck restoration project. 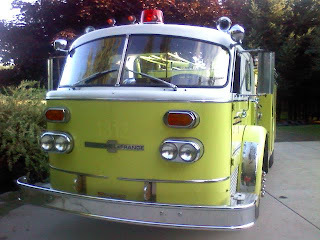 The main fire engine from my small town, a custom built 1964 International engine, which is still in service btw, is up for sale... I can buy it, but I have no means to store or restore it. This engine has long history to it, with my uncle being the first log entry when it was purchased, and my brother being the current last entry from the last call it went on. This truck carried my father's casket and was "his" engine for the 30 years he was chief. I can't lose it, I just don't know how to get it. Thanks for the nice words, Happy. It's a big chore, a long-term project. As long as folks don't expect daily (or even necessarily weekly) weekly updates, we'll be good.